Entertaining in a breathtaking mansion was an integral part of Victorian times. The Proctor Mansion Inn easily accommodates groups, both large and small, for business and pleasure. Your event will shine within 1860’s architecture where we cater to your needs. Please contact our Event Coordinator at events@proctormansioninn.com with any questions that you may have. You may also schedule a complimentary appointment for a tour of our venue and to discuss the details of your event. 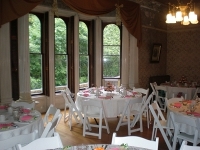 Make your private function an event to remember within the charming décor and atmosphere of the Proctor Mansion Inn. Our L’enfant Ballroom lends elegance to any type of celebration, such as Birthday Parties, Bridal Showers, Baby Showers, First Communions, Bar Mitzvahs, Graduation Parties, Rehearsal Dinners, Reunions, and Teas. Soaring staircases and views overlooking the gazebo on the town common provide ideal settings for weddings as well. Photo Session Venue Rental – Our venue is available inside & outside for family portraits, Bridal photos, Proms or other special occasions. Contact our Private Function manager for hourly rates! Business meetings that will leave a lasting impression! We offer conference and meeting facilities to delight and impress your guests and colleagues. Bring your group for a half day or full day meeting. Extend your stay overnight and enjoy Wrentham’s many restaurants and retail shops. Click here to vew a photo slide show of our recent events.